Last weekend my bookclub got together for a birthday celebration since there were several of us with April birthdays. 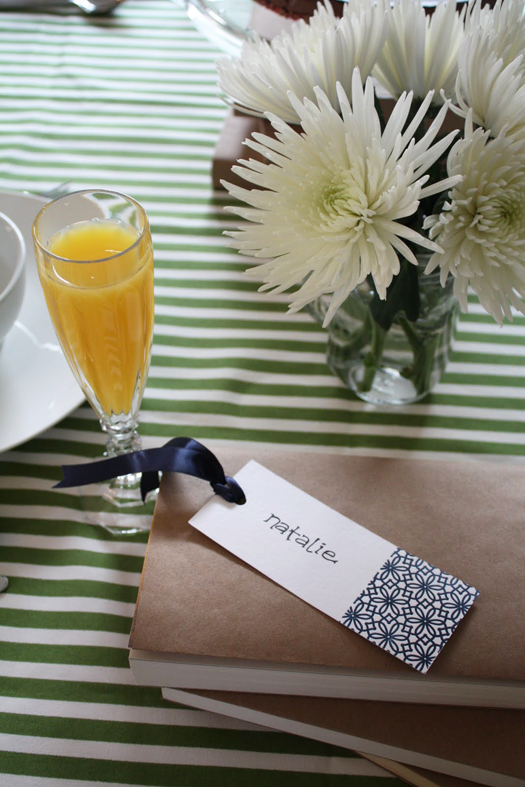 We held a simple brunch and I offered to decorate so I could have an opportunity to test out my new Epic machine, sent to me from Lifestyle Crafts. 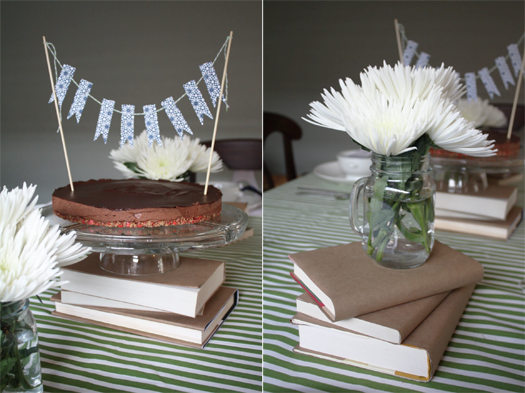 I set the table with a kelly green & white striped cloth, and created centerpieces by wrapping our club’s books in kraft paper and stacking them up between mason jars of simple flowers. 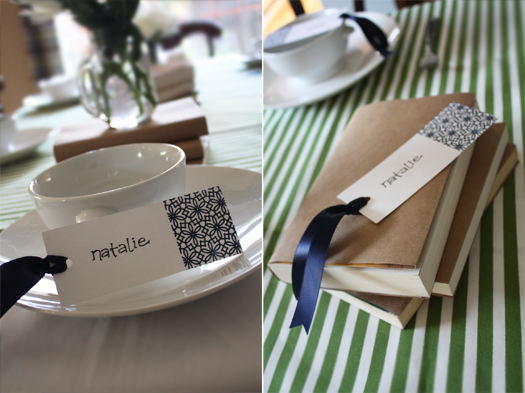 As place cards and favors, I designed bookmarks using the letterpress feature of the Epic and tied them with a navy satin ribbon. The letterpress process was a bit tedious and didn’t give me the deep impression and even coverage of a professional letterpress print, but that aside I think they turned out pretty good. Frankly, just being able to create my own letterpress products at home gives me insane joy. For this project I used one of Lifestyle’s stock plates, but you can actually design and order your own custom plates too... next time I’ll definitely go that route so I can get exactly what I want. 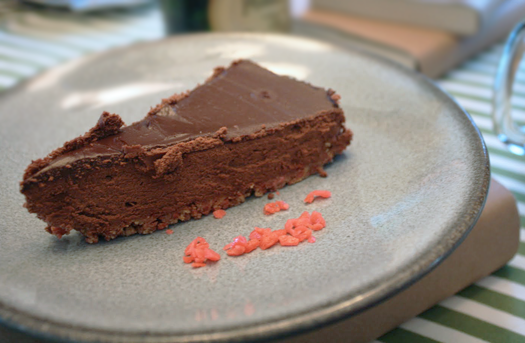 Oh yes, the cake. My friend Chris outdid himself with the baking... he actually made the Pop Rocks cake!!! It was everything I hoped it could be too... delicious velvety chocolate with a surprise burst at the end of each bite. Seriously, it may have been one of the most fun things I’ve ever eaten. Hope you enjoy this simple brunch and stay tuned... on Monday I’m running a *GIVEAWAY* of an Epic machine combo kit! Come back to enter and you could win one for your very own. 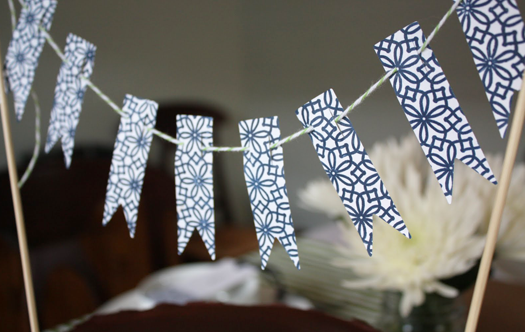 In addition, Lifestyle Crafts is offering a discount to Birthday Girl readers for 20% of all products on their site through the end of the month. 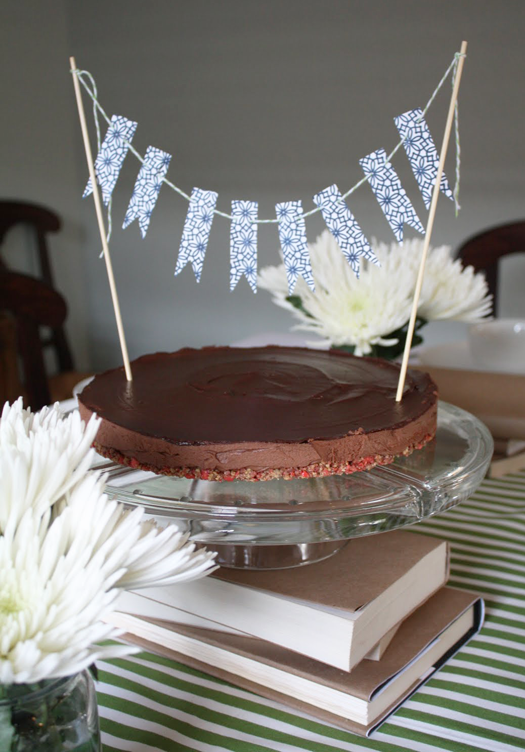 Just enter the code: BLOGBIRTHDAY at checkout. looks so simple and cute! i love it! and the pop rock cake sounds awesome! can't wait to try and bake one myself! Beautiful Party! 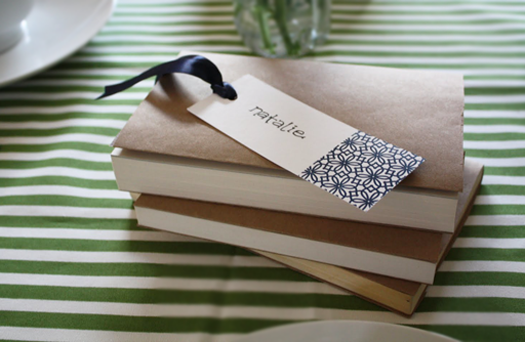 Love the bookmarks as place cards. I have an Epic and I agree, it is a little tedious and takes a lot of trial and error but it is a lot of fun to do letterpress at home! I LOVE the idea of a bookclub brunch! And this turned out to be so peaceful and simple, with clear beauty! Hi there! I think this idea is awesome and was hoping that you might add it to my Easter and Spring Linking Party to share with my readers. If you are interested, you can go here http://bakedbyjoanna.blogspot.com/2011/04/easter-linking-party.html to enter. Thanks! Love the simple, sophisticated design. Perfect for a book club! soooo pretty!! You have such great taste:) I am dying to start or join a book club! Do you love being a part of one? Are they friends or strangers you've met through the club? What an awesome party & idea! I love books and reading, this is so fun! I believe I've mentioned in previous posts that I'm in love with your blog, and this party seals the deal. So creative and lovely. I'm planning to repost and link and credit back to you this week. If this is a problem at all, please let me know. LOVE IT! These are adorable place cards, chic, esp wit the added ribbon.. I quite like it, and like it a lot! 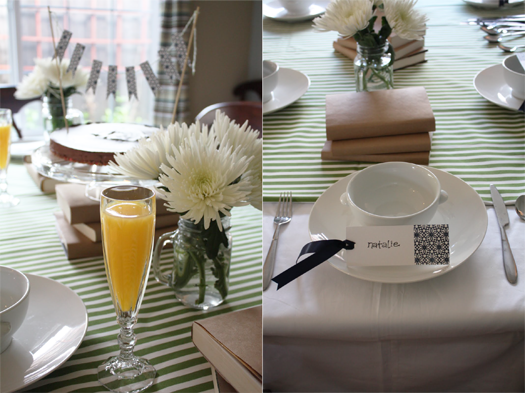 Super idea for your book club brunch! Everythng is so beautiful...especially luving the lacey yellow cupcake stands. Thinking of all the possiblilities to make gift bag label tags to attach to treats! I want an Epic too! That cake makes me want chocolate soo bad!